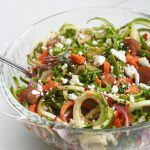 Zucchini Noodle Spaghetti Salad Recipe — A quick & easy, healthy side dish for summer potlucks or cookouts! FRI-nally, it’s happened to me. Right in front of my face, and I just cannot hide it! Needless to say I’m amped the eff up. It could be the double shot of Recipe Redux this morning that is putting my TGIF cup up to Venti status. Not even kidding, I had to google that. Do the Starbucks hate me for saying medium instead of tall? The world may never know. Ah, the zoodle. Food trend’s birth child, distant relative to chia pudding, overnight oats, and acai bowls. 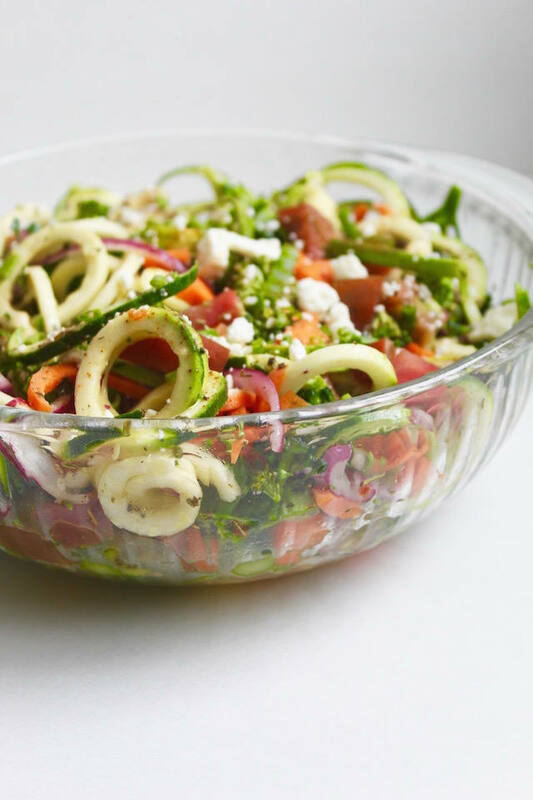 Just in case you’ve been living anywhere else other than a food blog, zoodle = zucchini noodle. AKA identity confused vegetables. And I am a full on supporter. Do you, zoo…dle. I’ve made my fair share of carb-envied vegetable noodles, but it never seizes to amaze me how many people still expect them to taste like pasta. It’s a vegetable. No 4 foot tall nonna is churning out fresh strands of vermicelli with a spiralizer. I’m a dream crusher, it’s what I do. Regardless, they are delicious, filling, and a viable noodle-shaped alternative to pasta for those who read the terms of agreement that they in fact are NOT pasta. Once they are in season, they are abundant and cheap, so I wanted to make sure I could fit as many of them into this recipe as possible. 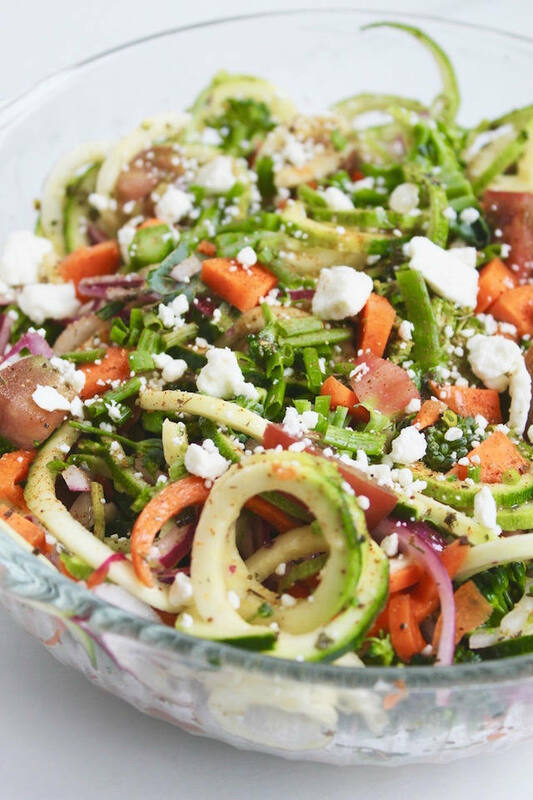 If you’ve never had spaghetti salad, it’s pretty much your usual Italian-y pasta salad…with spaghetti. How it got it’s name, I’m still trying to figure out. I had a fridge full of carrots, broccoli, and tomatoes begging to be used from my CSA, so that’s what I did. Plus, the stars must have been aligned just right, because I (gasp!) made my OWN dressing. I know, I know, crazy talk. I used this recipe but added more vinegar, less oil, and some Dijon because I’m all team emulsification. So I encourage you to use what ever veggies are on life support in your crisper drawer, or whatever is looking good at the grocery store/market/farm/next door neighbor’s garden that day. 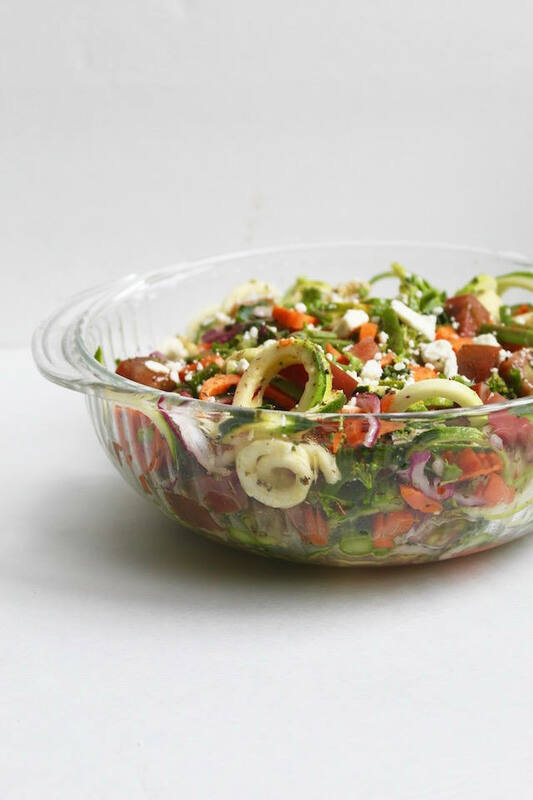 And if you’re feeling like Giada, make your own dressing. Buy on sale. Zucchini goes on mega sale once it is in season. If you have a farmers market nearby, I bet it is even cheaper (and local!) than the supermarket. Buy in bulk. Purchasing a block of parmesan, and whole veggies instead of pre-chopped is less expensive. It does require a little more time, but can be done ahead of time as well. Use up leftovers. 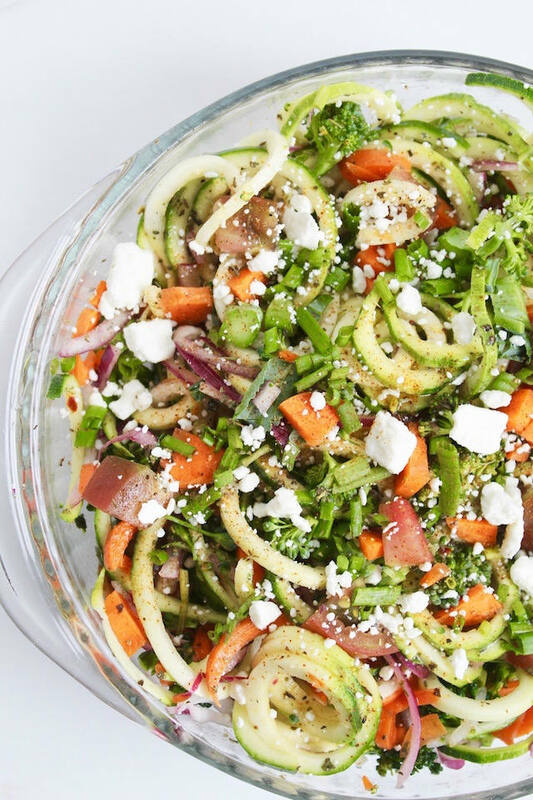 If you have a fridge full of veggies without a purpose, throw them in! Use what you have on hand & save $$$ and a trip to the grocery store. 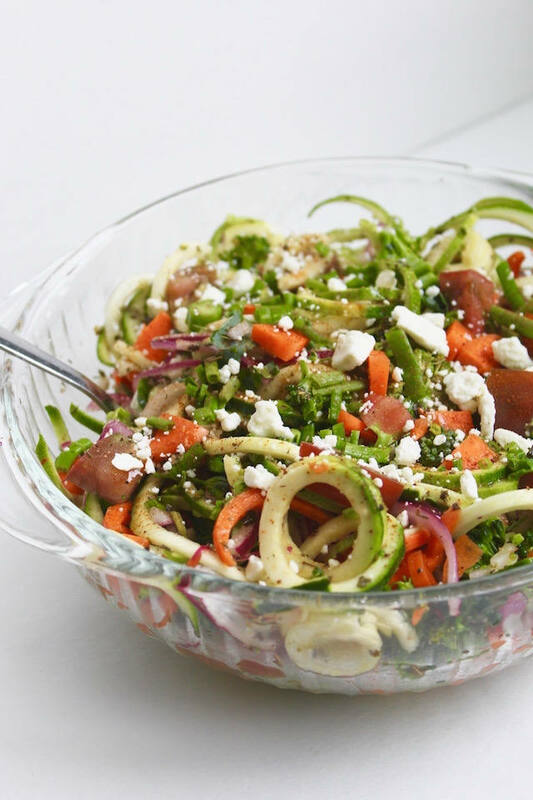 A quick & easy, healthy side dish for summer potlucks or cookouts! Toss with Italian dressing and cheese until fully combined. Let sit at least 30 minutes in refrigerator. Top with chopped herbs and cajun seasoning, and serve. * Omit or use dairy-free cheese alternative to make vegan-friendly. ** use a certified gluten-free option if needed. Have you made any veggie/fruit noodles? This looks delicious! 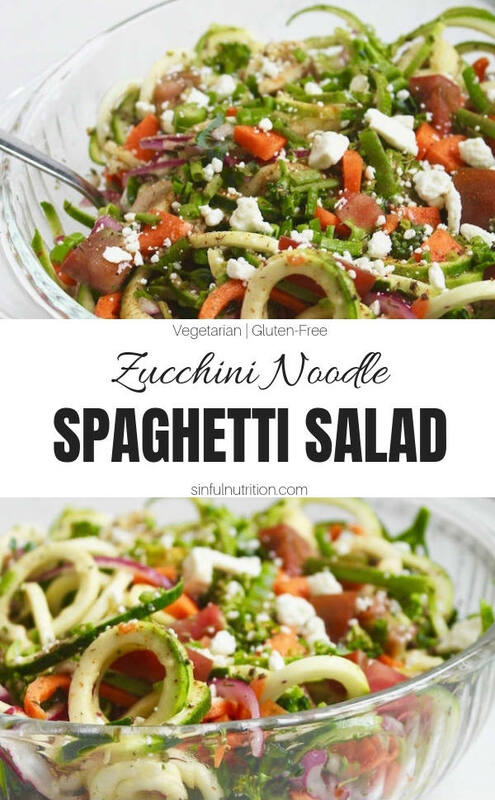 I need to try a recipe using veggie noodles!